Tuesday, Aug 21, 2018, 9 a.m. – 12 p.m.
*** As of 6:00am, 8/21/18, this program is being postponed due to unhealthy air quality. We will reschedule in the next few weeks. Please contact urbhort@uw.edu with any questions. The Duwamish Greenbelts Management Plan identified primary management issues for the Duwamish Greenbelts Reforestation Project, some of which include lack of forest complexity, low forest age and density, and low native plant diversity/high invasive plant occurrence. 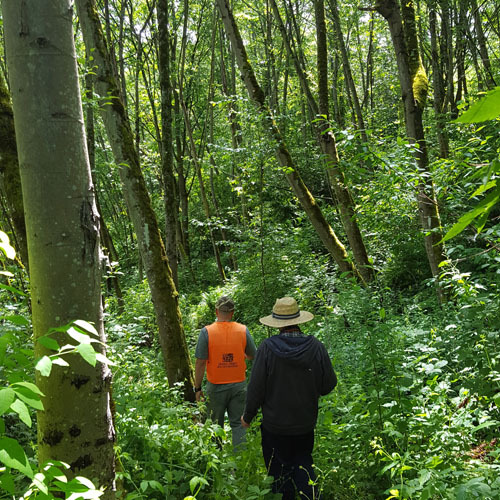 Several prescriptions outlined tasks for managing the vegetation of the Duwamish, which include managing hazard trees, thin dense forest stands, and identifying/creating canopy gaps. The prescription area is a 24-acre hardwood-dominated forest site to be treated by creating canopy gaps in combination with other restoration practices in order to promote site conditions conducive to conifer establishment and increased native forest diversity. Attendees will understand the reasoning behind, use of, and lessons learned in thinning and other techniques used on this urban forest restoration project. This foot tour will primarily be held on uneven terrain with some steep elevation changes. Please wear appropriate footwear. We will meet in northeast corner of South Seattle College. The address is 5649 16th Ave SW, Seattle WA 98106. Enter from the northernmost entry off 16th Ave SW.
Instructor Michael Yadrick Jr is a Plant Ecologist with Seattle Parks and Recreation. He joined the Green Seattle Partnership team in 2011. He is a Returned Peace Corps Volunteer (Bolivia 02-04) and former AmeriCorps member. He also worked with several land trusts before returning home to Seattle. Michael currently directs the work of professional crews citywide, and is spellbound with every single madrone tree he sees in the city. Professional tree-hugging during the week, you can also find him exploring public stairways, getting up early to run in nearby mountains and playing at park playgrounds with his 7-yr old son.